The Tampa Bay Buccaneers kicked off Day 1 of OTAs Tuesday and among the biggest highlights from the day is kicker Chandler Catanzaro nailing all five of his field goal attempts. Meanwhile, rookie kicker Trevor Moore finished the day 4-for-5 on field goals. Considering all the drama surrounding the Bucs placekicking position, this is great news for the Buccaneers, especially after the past few seasons which have consisted of shuffling the team’s roster and one too many kicking game woes. Although the Buccaneers just signed Catanzaro to a new deal in free agency, the position has been one of the team’s most prominent issues and among their biggest concerns for quite some time now. 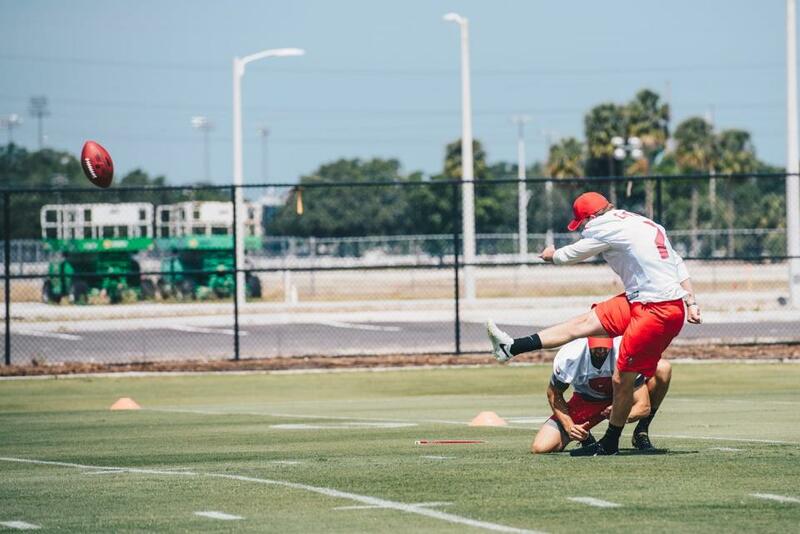 Considering all the issues surrounding the Bucs “kicking curse” and lackluster kicking game, it’s no surprise to see general manager Jason Licht and company determined to ensure Tampa Bay’s kicking game woes don’t resurface once again this season. Catanzaro finishing the day with a flawless performance is definitely one step in the right direction no doubt. The next media OTA is Thursday at One Buc Place, so be sure to stay tuned for more updates and news throughout the week.